There are some online casinos that you want to keep coming back to, because of their cool looks, user-friendly features, and hot promotions. One such casino is the All Jackpots Casino. This casino, established in the year 2003, has all the ingredients that appeal to online casino fans – great looks, good game range, superb promotions, and complete security. The All Jackpots Casino is owned by the Jackpot Factory group, a well-known name in online gambling circles. Like all casinos from this group, the All Jackpots Casino too is heavy on looks. An attractive maroon background sets off the colorful foreground and pictures quite beautifully on the home page. Apart from the color schemes, what stands out at the All Jackpots Casino is the simple and brilliant layout. The home page has all the links that you would want, including the games available; so if you were a member and wanted to start playing as soon as you arrived at the casino, all you had to do was click the relevant game link. 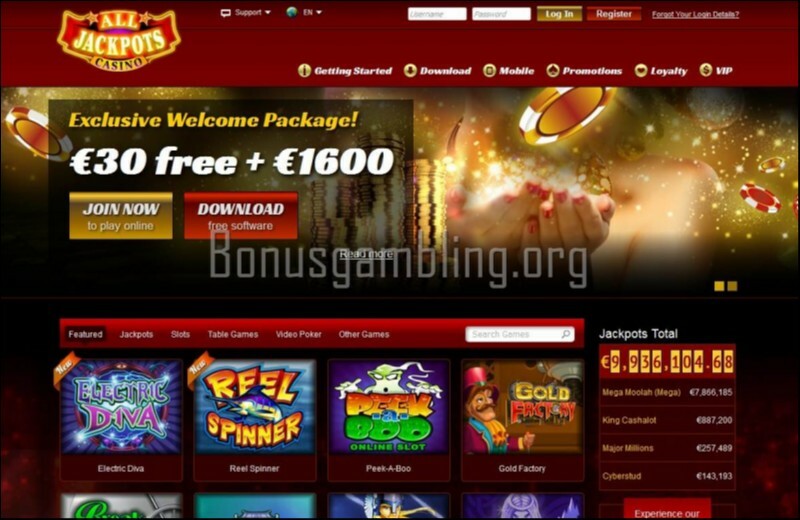 The cool interface and layout is provided by the software that powers All Jackpots Casino. The Microgaming software is one of the best in the industry, and brings to the casino a range of features that you would not find in casinos running on other casino software. You can download the software to your computer or play directly from a browser using the instant play mode. You can play hundreds of games at the All Jackpots Casino, and most of them are slots, making it another cool slots casino to check out. However, there are other casino games on offer as well. You can play, apart from a range of slots, blackjack, poker, craps, roulette, baccarat, video poker, Sic Bo, Keno, and many more games. One other thing you are guaranteed at the All Jackpots Casino is excellent customer support in seven different languages – English, German, French, Dutch, Spanish, Portuguese, and Italian. You can get in touch with a friendly and efficient customer support executive 24x7 through live chat, e-mail, and telephone. The casino accepts players from all states of the United States of America except Illinois, Indiana, Kentucky, Louisiana, Michigan, Nevada, New Jersey, New York, Oregon, South Dakota, Utah, Washington, and Wisconsin. The All Jackpots Casino is a completely legal and secure casino. It is licensed by the Kahnawake Gaming Commission of the Mohawk Territory of Kahnawake, and uses state of the art security technology like 128-bit SSL encryption to provide you with a completely secure environment for a fun and exciting gaming experience.